Industrial Decor is really popular right now. I can totally see why. The clean lines that lend themselves a little modern touch, but at the same time seem a bit vintage. To me, industrial decor perfectly mixes the old and new and it all seems to have such purpose. Using pipe and galvanized metal is relatively inexpensive to use for DIY projects, but the final product always looks far from that. The use of weathered woods and forged metal are a little masculine, but still pretty enough for us ladies to enjoy the style, too. 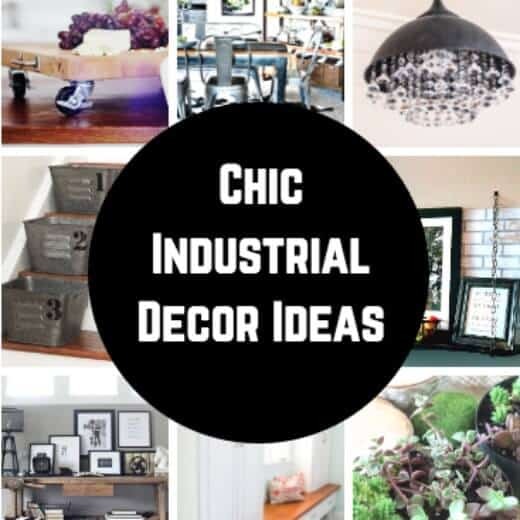 Today I wanted to share some industrial decor ideas that you can do yourself and include in your home. 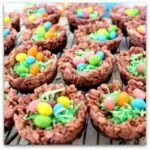 I know you will love them as much as I do! 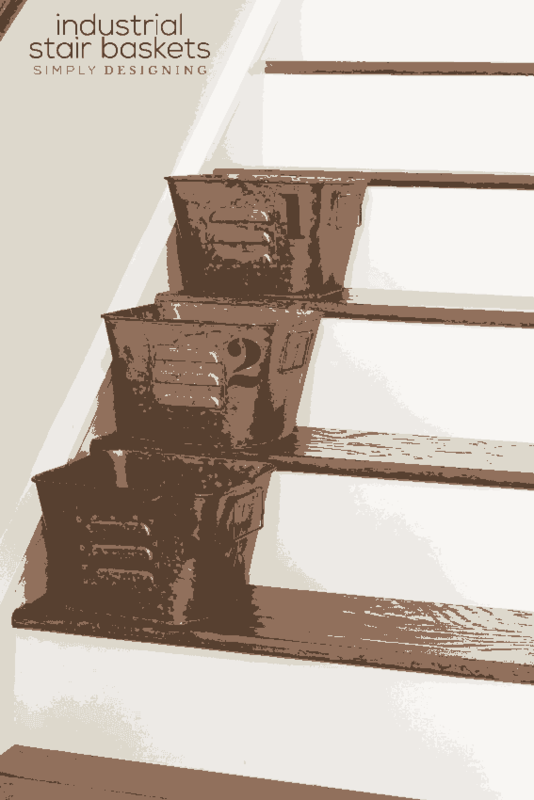 I think these industrial stair baskets from Simply Designing are both stylish and solve a multitude of dilemmas in the home. First, I love the galvanized look and those stamped numbers are pretty darn cool. Each of her kids has a number and these baskets become so useful. Throughout the day, she can put the children’s items in their basket so they can take them upstairs and the living area stays nice and tidy. At my house, I think these would be great for laundry. Once one load is done and folded, each kid gets their stack put in their basket. They also happen to look very stylish against those beautiful stained steps. So pretty! 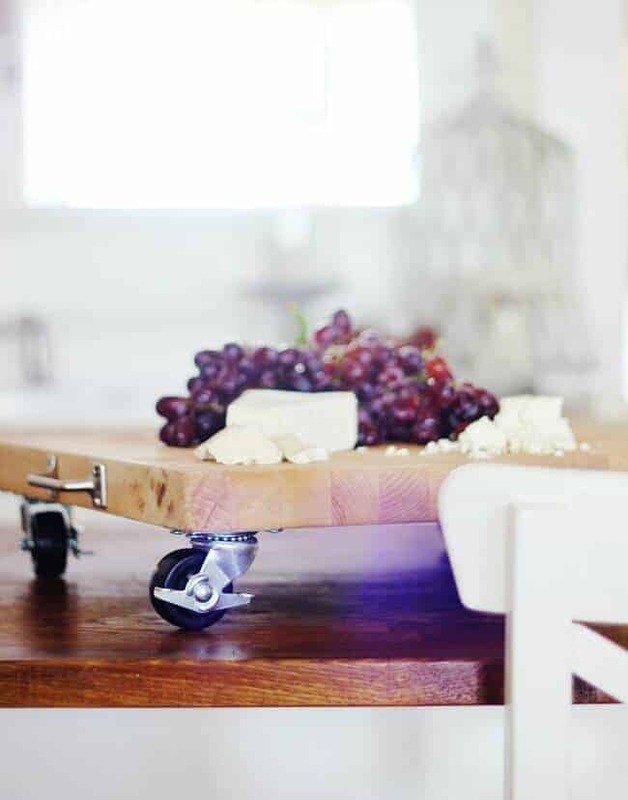 How about this amazing industrial farmhouse cutting board by Thistlewood Farms? I love the design! She added rolling wheels that are so useful and they even have brakes. The handles on the side are the perfect touch, too. This is such an easy beginner wood working project. I may have to try this one out myself! I love it when unexpected items are used in such a useful way. 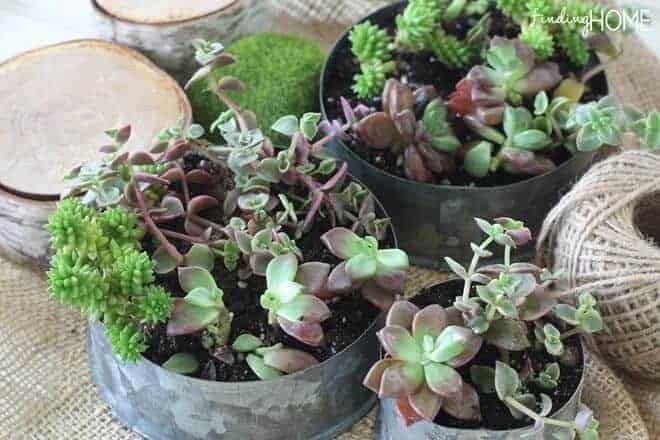 Laura from Finding Home Farms took galvanized plumbing materials from the hardware store and used them to plant a beautiful succulent garden. Doesn’t it look so cool? It is so creative and I love the idea of finding items at the hardware store to use in your home for decorations! The mudroom of Four Generations One Roof is beyond beautiful. I had such a hard time choosing a picture to show you guys, because it is that amazing. The exterior is all about simplicity and subtle beauty. That wood is just gorgeous and so pretty against the white cabinetry. 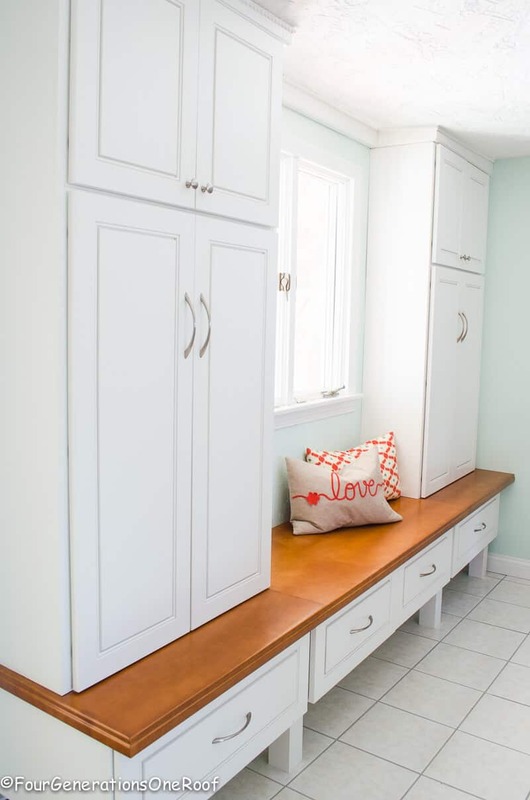 You have to head over and check out what is behind all of those doors and drawers…. storage heaven and even the hardware is pretty on the inside. Love this look! This room isn’t even finished yet, but it is already amazing. 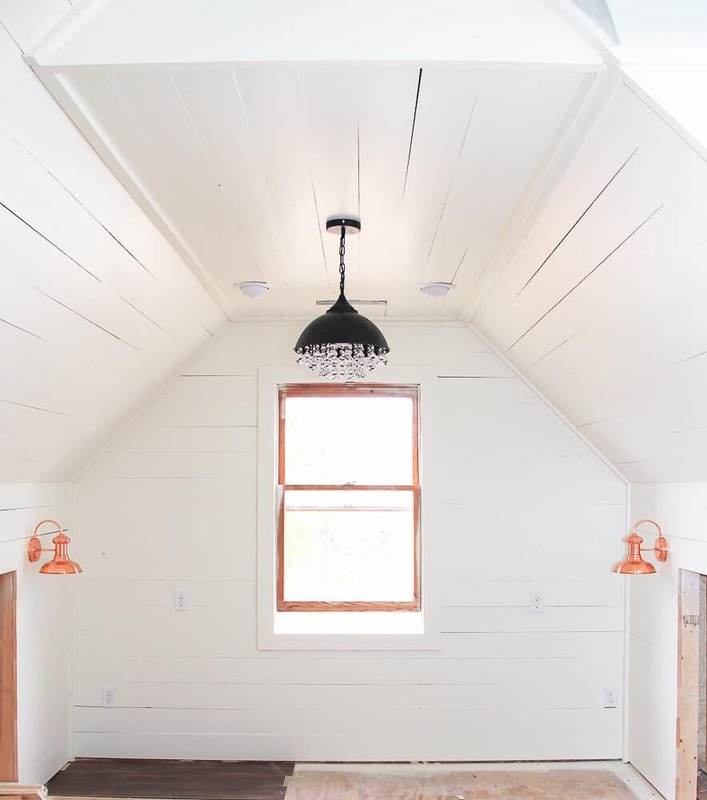 Beth from Unskinny Boppy is renovating an attic and turning it into quite an amazing space. I am so in love with the lighting she has chosen. That chandelier had me at hello. It is industrial at its core, but those crystals add just the right amount of glam. I’m a fan for sure. I can’t wait to see what the space looks like when she gets finished. How about those copper sconces, too?! 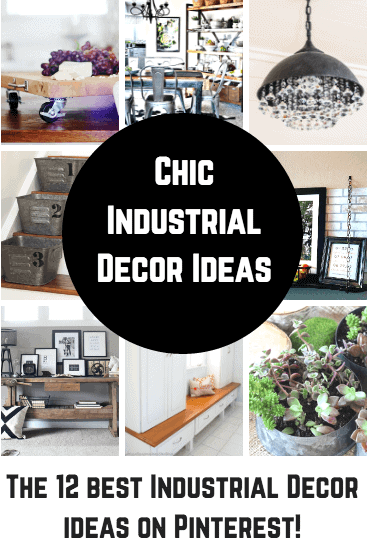 If you love Industrial decor the home of Taryn from Design, Dining and Diapers will have you swooning. Every single room is just perfection. You would think that having so much industrial hardware and furnishings that her home would seem hard, but it is anything but. It is warm and welcoming and there are too many insightful design decisions to count. I thought I’d share my favorite piece. This console table that is full of trinkets, treasures and family mementos. This home is just utterly beautiful… you have to check out her live edge kitchen table… dreamy! In My Own Style is known for taking something ordinary and making it into something out of this world. These curtain rods are the perfect example. 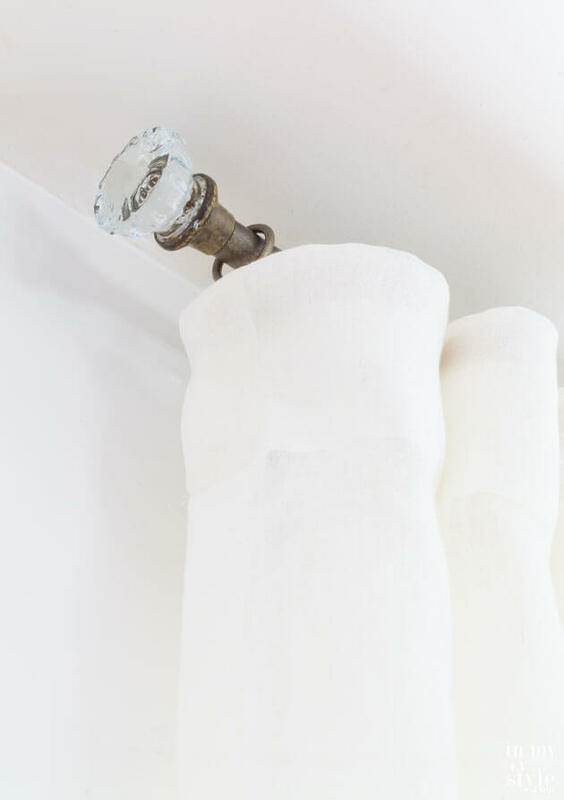 She took vintage door knobs and plumbing pipe and made the most beautiful DIY curtain rods. They are so pretty and you can customize to any length you need. I love the simplicity of the white curtains with that gorgeous drapery hardware. This is another dreamy room. The 36th Avenue’s Industrial dining room is nothing short of inspiring. There are so many items to pick from that I love that are my favorite. I think I’d have to go with the shelving unit. What about you? Isn’t it just beyond beautiful? Uncookie Cutter made the coolest industrial shelf. This is a piece of wood suspended by hardware grade chain. I love this idea and it is exquisitely decorated, too. Look at that beautiful picture and that basket full of baskets. 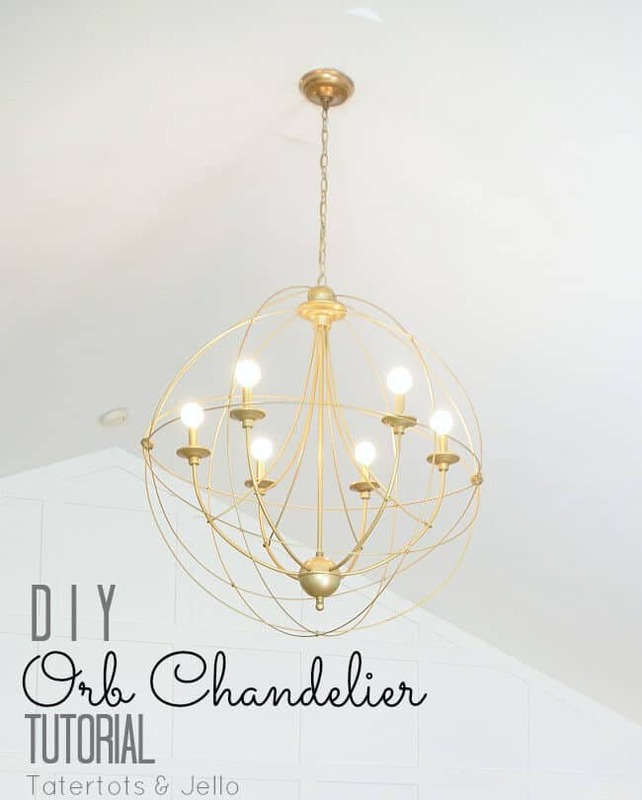 I love this DIY Orb Chandelier Tutorial by Tatertots and Jello. 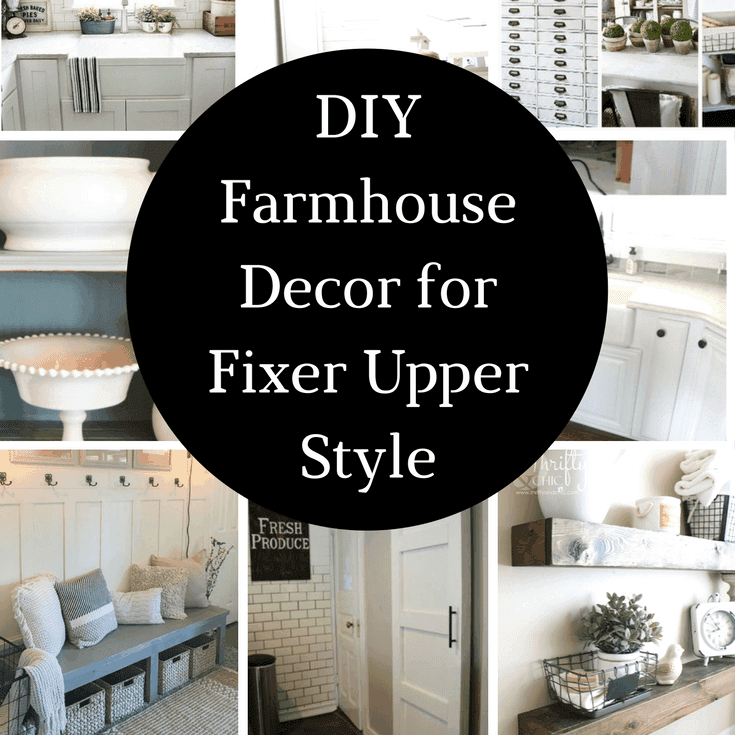 This is the perfect project to dip your toes into Industrial decor. It has the perfect mix of glam with the gold. I love how big it is and it is an affordable way to fill a large space. This is also a great knock off project. 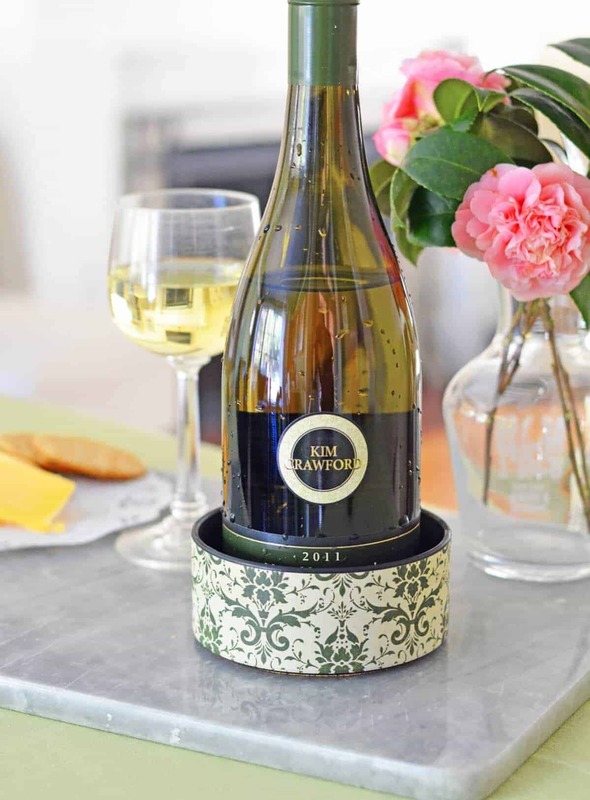 Amy from Mod Podge Rocks made these coasters out of PVC caps. How cool are these? 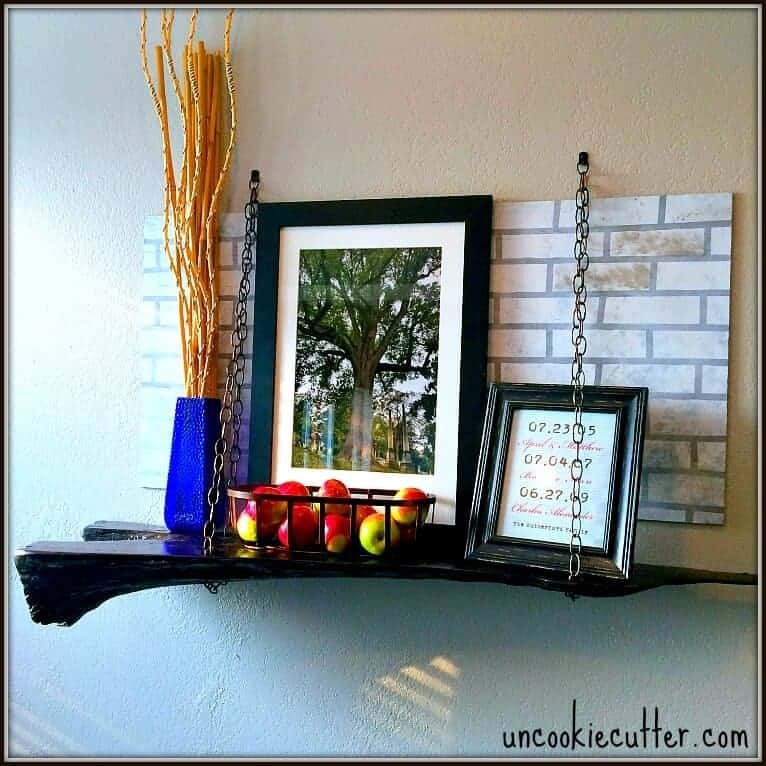 Industrial decor doesn’t have to involve totally making over your home… these little projects are a great way to start! I love how The Taylor House has renovated their kitchen. They even added this amazing butlers pantry. It is constructed by galvanized piping and it is beautiful and completes the space perfectly. 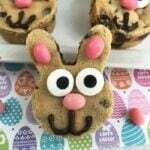 You have to hop on over to see her kitchen… so so pretty! 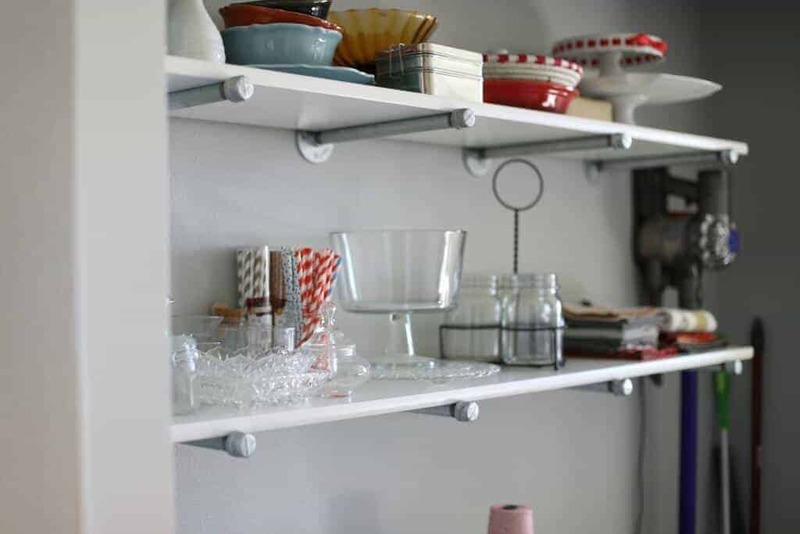 Thanks so much for including my hanging shelf in this great roundup! Beautiful choices!